KERR LAKE PARK WATCH submitted this article recently to area newspapers and several papers printed it in variations. For you, our members and visitors, we want to provide you with the entire article as the renovated sites in this story now set the pace for recreational RV camping. 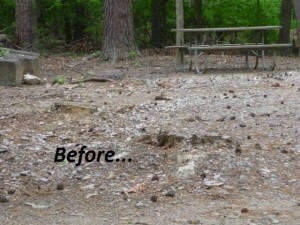 We hope you will contact NC State Parks and/or your legislator and push for more such renovations. Campers’ reactions to renovations soar as popularity and reservations of rehab sites goes up. A team effort from park staffers yields the best designed and most RV camper friendly public campsites in North Carolina state parks and recreation areas, maybe even for all public camping areas. NC State Parks now gets it: define the resource user area with borders, make it close to level, putting most of the campsite surface on the same level, then make it 3 feet for RV/Trailer slides, 8 feet for camper, 8 feet for awning and the rest for a fire pit and a tent site: perfect! 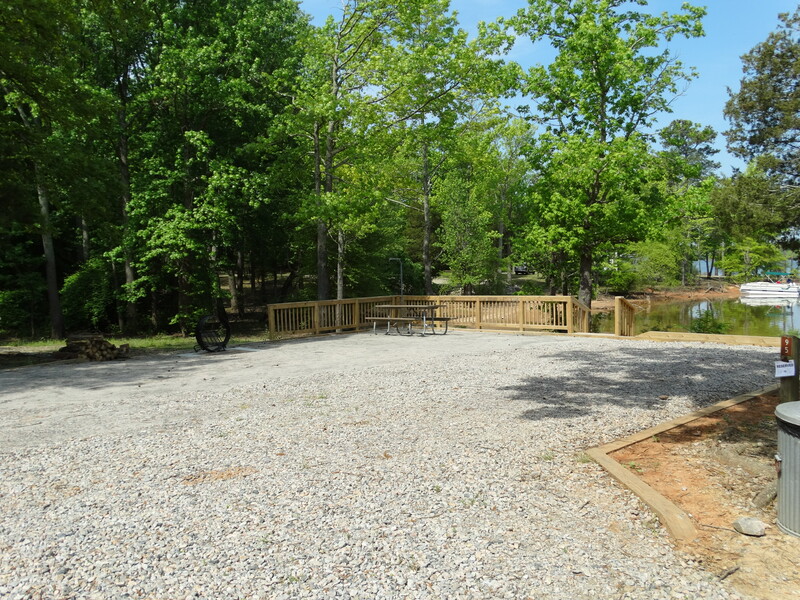 The camping public at Kerr Lake is buzzing about the seven (7) newly rehabilitated campsites at Hibernia State Recreation Area. Campers and Kerr Lake Park Watch agree the renovations are timely and greatly improve the camping experience. The sites were previously in rough shape and mostly very uneven with stumps, washed out sand or a lot of the rock base being the original quartz stones found naturally on the land turned campground over 50 years ago. There is a story within a story here though being the overflowing positive public reaction to the campsites and how they got sort of a miraculous makeover. The latter part of the story will come in a while. State recreation areas, particularly those at Kerr Lake, differ from state parks for two main reasons: 1) the majority of the visitors come to interact in/with the water, and 2) with variable water levels that sometimes flood some of the campsites, additional planning and site stabilization has to go into campsite construction or renovations. Since many Kerr Lake campers avail themselves of all the space, a site can easily be full with an RV, trailer or a pop-up camper, plus a tent, picnic canopy, floats, cars and more. Like a number of campers around the Kerr Lake parks, the Cannady’s have been seen for years, cooking, riding bikes, fishing and visiting. There’s a lot of their kind at Kerr Lake. They love it. Demonstrative of that is the fact that Eddy and Terry Cannady were observed by several people earlier in the week picking up trash from a site where someone else left some debris lying around. There was Terry and Eddy picking it up. That’s not uncommon for campers, particularly long term campers who become attached to their particular parks. That brings the other part of the story, the story of how Kerr Lake Park Watch worked with the local state parks staff to get this project done. 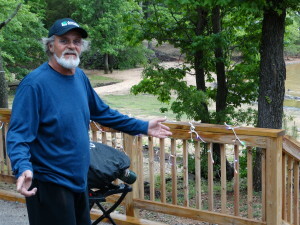 “I have to first give credit to District Superintendent Dave Cook and to Kerr Lake Superintendent Bryce Fleming for finding the funding sources and for having the courage to renovate these seven sites ‘in house’ and for showing everyone else in public parks how to build a better campsite, said Kerr Lake Park Watch’s Frank Timberlake who actually was called in a few times to offer input, even help measure for the renovated campsites. Timberlake added that after seeing the contractor shambles of new sites built a few years ago at Henderson Point, campers and the leaders of Kerr Lake Park Watch were dead set against that happening again at Kerr Lake. His reference is to RV sites that are “split-level” where a camper’s awning covers nothing but the steps and rocks between the camper level and the lower picnic level. They just don’t work. Because most RV’s and trailers have expanding slides of about three feet, the regular camper width of eight feet, an awning width of eight feet, plus an area for tenting, cooking and campfires. With the good comes the bad. The following is a guest testimonial/commentary by camper and KLPW member Larry Matthews. 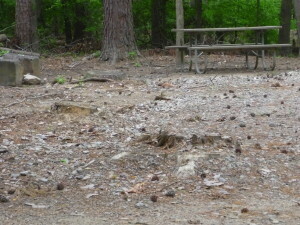 While neither I, nor any of my camping friends and/or family were involved, I am a camper and I’d like to offer my sincere apologies to the staff at Hibernia State Recreation Area at Kerr Lake for the extra effort they had to put forth a couple of weeks ago when four teenagers trashed the Area 2 men’s bath house. When we arrived for our 10 day stay, I thought “how nice the bath house looked.” It was clean and fresh. Then a fellow camper allowed their four (4) teenagers to be out unsupervised after midnight one night. While everyone was sleeping, the boys proceeded to throw toilet paper wads all over the place, stop up every toilet and to cut and/or to burn the shower curtains. Fortunately, the camp host observed them hanging around the bath house from his trailer that night and knew exactly who had trashed the bath house when he got a knock at his door early the next morning. The four young culprits were quickly identified by the rangers and required to suit up with those big nasty yellow gloves and help clean up their mess. But, they could not repair the curtains. (And it’s doubtful that with no budget, the state can replace them.) Then, they were asked to leave the campground. Kudos to the rangers for making them pack up and leave immediately. Please, keeping your kids under control is your responsibility first, before the rangers. And most of all, let’s all take care of our parks and teach our kids to do so, too. Again, Hibernia park staff, on behalf of the good campers, I apologize for your inconvenience caused by those kids and thank you for your efforts. You are good hard working people who should not have to endure that kind of drama and trauma. Thanks for all you do! P.S. The refurbished sites in Area 2 (93-99) are the talk and the rage of the campground all week. They are awesome! Itâ€™s not really polite, but letâ€™s have a little plain toilet talk. Forget the problems of government, forget bureaucracies that move at a snailâ€™s pace, there comes a time when human decency, that means that we as a people act more like people than animals, must come back to the forefront of the way we as people behave. I, being Frank Timberlake, the head blogger here at Kerr Lake Park Watch, make it a point to ride the campgrounds around the lake and stop by all the facilities operated by the US Army Corps of Engineers, and the states of Virginia and North Carolina. There is a multitude of public facilities, thank goodness, especially if you are visiting for any period of time. And now I vent. There is a small army of dedicated, overworked and underpaid maintenance professionals who keep the water running, the lights on, the showers scrubbed and the toilets clean. Bernie and his crew in Virginia are one group and I know one young man on the NC side, Tyrone, whose entire focus and dedication is on his job and cleaning the restrooms is part of that job. 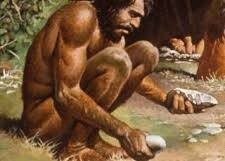 After seeing a restroom being cleaned in a Kerr Lake park today, I later stopped back and either a baboon unfamiliar with the usage of modern toilets or a Neanderthal human had messed all over the outside of the toilet. Thatâ€™s right; I said the outside of the toilet. If it was an accident, then the person should have cleaned up their own mess. This simply cannot be a way of having fun at a park, can it? I am told that such occurrences are more and more frequent. Those of you who are reading this are probably not a part of the problem, but we all need to be a part of the solution. People have to take more accountability for their actions, especially when those actions come into play at shared facilities like parks. We do not live in this world alone. Unlike hotels with private baths, with the use of shared restroom facilities come shared responsibilities to see that our parks are maintained. To me, if you witness someone abusing park facilities, they should be reported and removed from the park, permanently or as much as allowed under the law. It is naive, but I would hope that next time the person who defecated that Kerr Lake public restroom would in fact, find it locked and would resort to having to use the woods, whereby his buttocks were tingled by the introduction to rectal poison ivy. Meanwhile, the next time you run into a maintenance worker cleaning a restroom or any part of the park, take a second and thank them! Their job is tougher than it should be. Thatâ€™s just my two cents. When the original campsites were put in around Kerr Lake in the 1960’s most consisted of a graded off site, sloped in relation to the ground around and fairly unlevel. Then came the lean-to’s, the tents and a few trailers. A good site might have some gravel spewed across it and a picnic table. Then came 20-amp electric service and shared water but the campsites still remained “undefined” meaning it had no borders. Campground borders keep neighboring campers friends and also do less damage to the land resource. Be sure to read and view to the end because it does get better! Now, with all the gadgets that campers possess, even tenters want electricity and water on a fairly level site, which around any lake that is a flood control project cannot entirely be level because of flooding; thus the site must be slightly downhill towards the water. Travel trailers demand 30-amp service and Fifth Wheels and Motorhomes demand 50-amp service, oh, and a level “defined” campsite that’s on one level! About the time that Kerr Lake Park Watch was forming several years ago, a construction company under NC state contract was building, or as we say, rehabilitating or a number of RV camping sites at Henderson Point while building a tenting campground. The irony of that is amazing. RV’s need fairly level sites for obvious reasons, but especially so their refrigerators and air conditioner units will work properly. 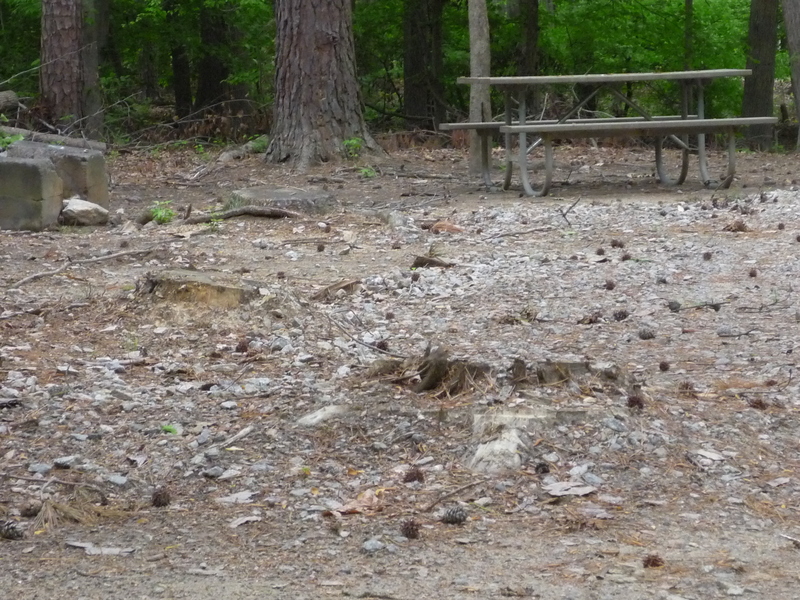 Here’s a few photos of what the State of North Carolina allowed the contractor to build from a design that most likely came from a non-camper within the Raleigh office of NC State Parks. The five (5) photos below show recently developed campsites at Henderson Point executed by a contractor to the design specification of the Division of State Parks. To a non-camper or the untrained eye, first glance might suggest what great campsites these are. Stop there. Now put out your awning from your RV or trailer and discover that there may not be enough room for a straight chair on the upper or lower level; forget a lounge chair. So the camper’s awning ends up covering mostly, you guessed it, rocks. All the food and meal preparations have to be taken up and down the steps and a number of these sites do not have a space big enough in the defined area for a tent or a tent and picnic canopy. Several of the sites are not “slide friendly” which means that the increasingly popular slide extensions (units with 4 and 5 slides were seen this weekend 5-10-14 in 4 of the 7 SRA’s at Kerr Lake) may run into trouble with the electric/water post or a tree. 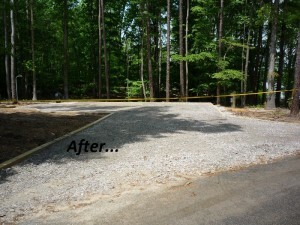 For the next rehab project the NC Division of State Parks used its design section, but merged into the process opinions and pertinent information from campers and from Kerr Lake Park Watch. Though the process of using rangers, maintenance people, mechanics, sanitation workers and a variety of people to rehabilitate campsites may not be the most practical and fastest way to build campsites, the process at Hibernia where two of seven renovated campsites, 98 and 99 are now open, has proven to be beneficial to two groups. Campers will instantly see the improvements favor from small campers to mega RV’s. The second group to benefit are those parks professionals who gained a better understanding of their coworkers and their leaders and the ability to see the right way to build a 2014 campsite. Everything the camper does on this site is on one level. There’s plenty of room for the slides and lots of space for the RV awning to cover. This site offers an enlarged fire and cooking ring, far away from the camper along with the lantern holder. Now, if you are reading this and listening NC Division of State Parks, here’s what you need to finish off sites 98 and 99 correctly. Screenings or powdery rock on the “living area” of a campsite are OK in thinking about tenters but (1) tent dwellers of today carry air mattresses and such, and (2) RV’ers don’t want to walk screenings into their trailers or motorhomes. A suggested finish is pea gravel. Next, please use timbers to separate gravel RV space from the living space. It’s not a hazard as campers expect and appreciate it. And lastly, don’t forget to notch the corners to allow flood waters of Kerr Lake to recede but to keep rock of whatever size in the improved campsite. And lastly, we at Kerr Lake Park Watch would like to thank NC Parks & Rec Operations Manager Mike Lambert, District Supervisor Dave Cook, Kerr Lake Superintendent Bryce Fleming and all those who have and are working on the Hibernia rehab project. It is only a start, but it’s a good start. 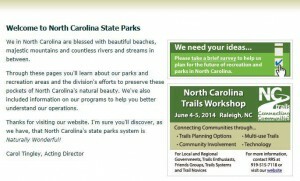 The Division of State Parks in North Carolina is reaching out to you who use state parks and more importantly to the members of Kerr Lake Park Watch, those of you who use the seven (7) SRA’s or State Recreation Areas of Kerr Lake, to tell the leaders of state parks what you want out of your parks. 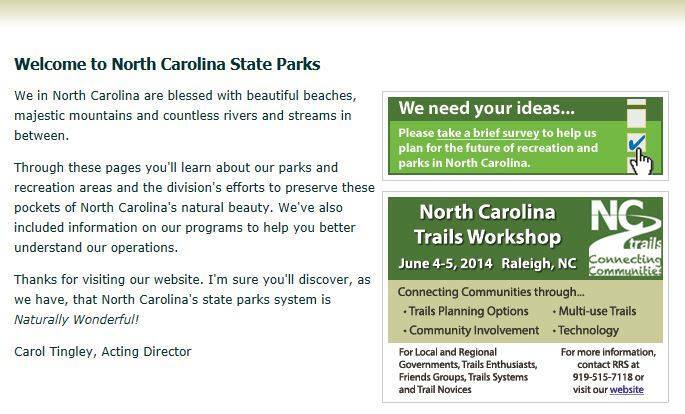 You really need to take the time to respond when the parks leaders in Raleigh ask for input. We call this “citizen time” when you fulfill your citizen obligation to tell appointed and elected governmental representatives what you expect, want and/or need from their governmental entity. It has long been said that the parks people in North Carolina, including Kerr Lake, is a silent majority. Here is a perfect opportunity for that majority to speak out and have input on shaping the future of parks at Kerr Lake and in North Carolina. The exact survey link is:https://www.surveymonkey.com/s/ncscorp_public. If you have the opportunity to list any ideas for the lake’s seven recreation areas on the North Carolina side, please send them to us at Kerr Lake Park Watch. That email is info@kerrlakeparkwatch.org.